From REDBULL.COM. Mayhem gives you some inside info on what the guys and girls are riding in Rio right now. 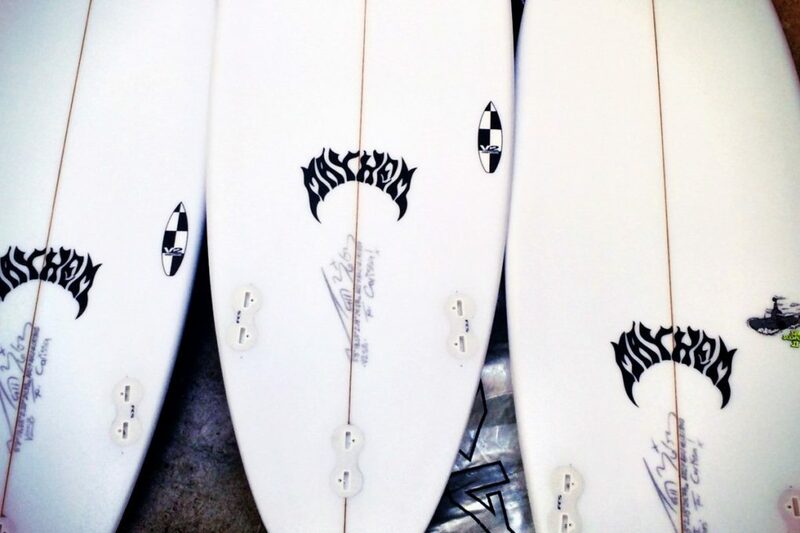 Matt Biolos’ hot-rockered beachbreak sleds for Kolohe, Taj and Carissa’s South American campaigns. Two weeks ago, the world champion Carissa Moore, as well as Kolohe Andino and Taj Burrow, received their just-made quivers from the San Clemente shaper Matt Biolos. Biolos, who rides beach break waves as a matter of course, is well-suited to making waves to fit the unpredictable curves of the Brazilian beachbreaks around Rio. But what he has to consider is the vastly different circumstances of each surfer. Carissa is winning everything in sight; Taj is placing at most events and Kolohe, despite shards of brilliance, has had a poor start to the year. Biolos made 15 boards for Kolohe, from 5’10” x 19” x 2 1/3” small-wave boards to 5’11” x 18 3/4” x 2 14” all-rounders as well as a 6’0” and a 6’1” tube-shooter. “It can be anything from waist-high mush to double-overhead closeout Off the Wall-style tubes out there,” says Matt. Throbbing! Let’s hope the blood pumps!